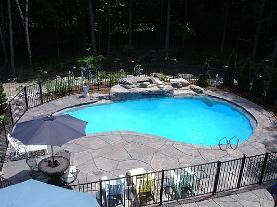 ALUMINUM POOL FENCES FOR HOMES AND PUBLIC SWIMMING POOLS. RUST FREE! RESTRICTIONS DIFFER ALL OVER THE USA. ALWAYS CHECK WITH YOUR HOA OR LOCAL BUILDING CODES. Swimming Pool Fence Restrictions differ all over the United States. In fact, pool fencing restrictions not only differ among states; they can differ even within the same city. Many jurisdictions follow the BOCA national codes in some form or other. Some jurisdictions strictly follow BOCA, other jurisdictions partically follow BOCA and yet, other cities/towns/counties (especially many rural areas of the US) don't follow it at all and have no restrictions. It's up to you to contact your homeowners association, your insurance carrier and/or your local building codes to find out what, if any, restrictions are in your area before your purchase and install a swimming pool fence. We are a proud fence supplier of all kinds of swimming pool safety barriers and we can accommodate, pretty much, any type of application or need. It is also a good idea to check with your homeowners insurance company because they may have their own requirements. 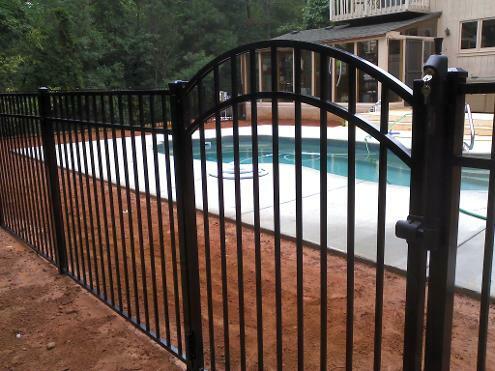 International Residential Code (IRC) has the same requirements for pool safety fencing. The space between the bottom rail and the ground must be less than 4"